In a recent survey conducted by Associated Chambers of Commerce and Industry of India (ASSOCHAM), aptly named “”High prices dampening the festive spirit”, over 200 people from the major Indian cities like Delhi, Mumbai, Kolkata, Chennai, Ahmedabad, Hyderabad, Pune, Chandigarh and Dehradun were asked about their Diwali spending budgets. 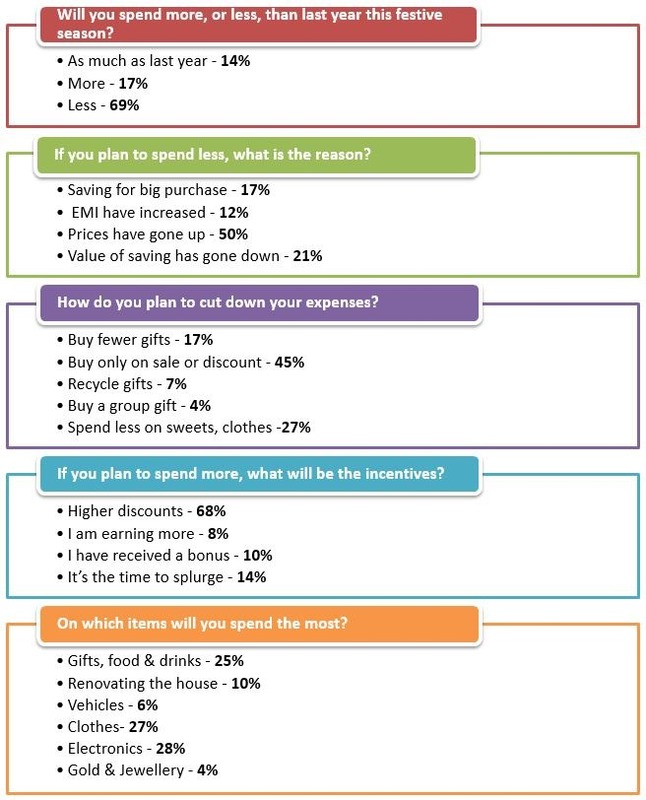 Over 72% of respondents confirmed that this Diwali, their income potential will severely hamper festive shopping. Majority of these 72% hard hit consumers shared that on an average, they would be forced to spend only 25% of their monthly salary on Diwali shopping. In terms of budget slashing, respondents from Delhi ranked first; closely followed by Mumbai (2), Ahmedabad (3), Kolkata (4) and Chennai (5). With prices of daily commodities such as vegetables, fruits and pulses at an all time high, middle class and lower middle class is forced to slash their festive budget. Diwali specials such as sweets, crackers, dry fruits, gift items etc would see less buyers this time, as the expenses are simply too much. If we compare the current price of Gold with last year, then we can observe that it has increased to 30% on an average. And prices of sweets, which are made from dairy products and dry fruits is witnessing a staggering increase of 55% compared to last year. Additionally, the values of savings have gone down by 15% and the EMIs are forever increasing. Over 76% of respondents shared that compared to last year; their monthly expenses on groceries have increased to an average of Rs 7000, which was Rs 4000 last year. Indian middle class has no option but to forget these ‘luxuries’ as the current income opportunities are not even allowing him to have a decent meal composed of vegetables and pulses. Will You Spend This Festive Season? FMCG; Consumer Electronics and Durables industry must be closely monitoring this survey conducted by ASSOCHAM as Dussera-Diwali season combined with Christmas and New Year are generally considered as peak shopping seasons. If the results from this survey holds true, then it would be a major blow to their overall marketing efforts. With sliding rupees, this industry is already under stress, and profit margins continue to drop. What are your plans for Diwali shopping? Are you going to slash your budget? We would love to hear your views!